The Cadogan Hotel exits onto Sloane Street, which is full of designer shops. Harvey Nichols and Harrods are just a 5-minute walk away. Knightsbridge Underground Station is 5 minutes’ walk away, while Hyde Park is a 10-minute walk. 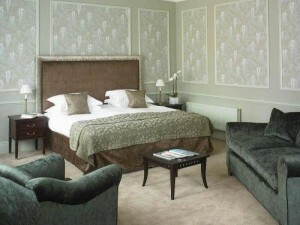 Situated in Central London, The Cadogan Hotel London is within a 10-minute walk of Sloane Square and One Hyde Park. Some of the popular features provided at this elegant 5-star hotel include a fitness centre and outdoor tennis courts. This non-smoking hotel offers a range of amenities, including 24-hour room service, meeting rooms and a coffee bar. Welcoming and helpful team members are available 24-hours a day. Additionally, the multilingual staff will be happy to provide local knowledge, ensuring a pleasant stay in London. Every elegant room at The Cadogan Hotel London comes with a mini bar and an iPod docking station, and the bathrooms offer showers and hair dryers. A refrigerator, a flat-screen TV and complimentary toiletries can be found in each. Cadogan houses a restaurant and a bar where travellers are able to unwind of an evening. The hotel also serves breakfast each morning. Cadogan Hotel is within a five-minute stroll of Harrods. The surrounding neighbourhood is also well-known for its shops and boutiques.